It’s a new dish to me. A completely WOW pulao this one! 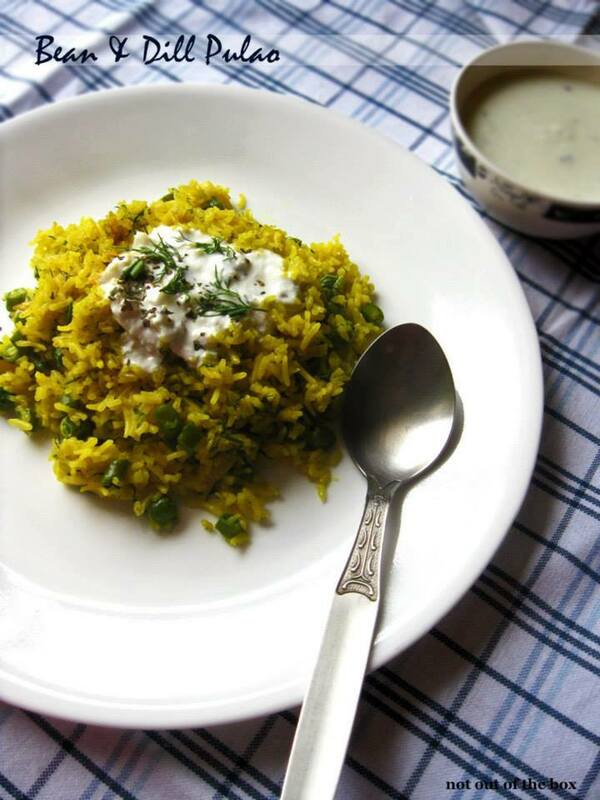 The lovely aroma of Dill make this rice dish very very spcl! And the Garlicky yogurt adds the extra zing to this dish while served together. Allover yesterday we enjoyed our Sunday lunch a lot with this newbie! In a cooker add all the green veggies. Adjust water to level the veggies in the pressure cooker. Close the cooker lid and take off the flame after 1 whistle. Open the lid after the pressure has reduced. Strain the veggies & keep aside. In a deep frying pan (nonstick preferably) add butter. Add the chopped onion, sauté the onions till golden brown in color. Drain the water & add the soaked rice, turmeric powder, salt & dill stalks. Mix well. Fry for 2-3 minutes on medium flame. Keep stirring. Next to add 1 cup of water. Mix, cover & cook on low flame. Check after 5-6 minutes. Now add the boiled veggies & half of the chopped dill mix & add some more water if required. Cover & cook till the rice is done. Keep stirring so that it cooks uniformly and doesn’t form lumps. Add sugar. Mix & cook for another 2-3 minutes. Your Bean & Dill Pulao is ready. Remove from heat. Keep it covered after the cooking to get the nice aroma when you are going to have it! Serve hot with garlicky yogurt. Stir the rice gently, otherwise the rice grains will become broken. Beat the yogurt. Mix rest of the ingredients with this. Your Garlicky Yogurt is ready. Spoon the yogurt on top of the rice & sprinkle some dill on it. Serve.